A ground-dwelling inhabitant of lowland rain forest, this species hops about on the forest floor or in low vegetation, seeking its insect prey. • DISTRIBUTION Amazonian rain forest in W. Brazil and adjoining areas of Colombia, Ecuador, and Peru. • REMARK Tapaculo is Spanish for "cover your rear end" in a joking reference to the cocked tail. 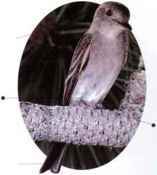 • nest A simple cup nest of * plant fibers in the fork of a twig. • Distribution From n.e. Brazil southward as far as C. Argentina; and from n. Brazil across the border into Surinam. Like the Old World wagtails, this is a slender bird with a long tail, which it bobs up anil down and does not "wag" from side to side. This species normally holds its tail cocked and frequents trees rather than water. It is usually seen in pairs, gleaning insects in open woodland and scrub. • NliST A shallow cup, close to the ground. • Distribution s. Bolivia, part of Argentina, and e. Brazil. 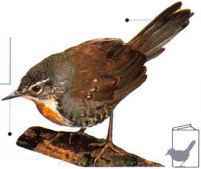 I his is a plump, wren-size bird with a tiny bill, found on forested dim mountain slopes, at altitudes where b'U the climate is either subtropical or temperate. Inconspicuous and often solitary, it creeps about hunting insects in the undergrowth. It occasionally makes short, abrupt llights, accompanied by an audible whirr of wings. • Distribution The Andes in a series of areas in Colombia, Ecuador, Peru, and Bolivia. 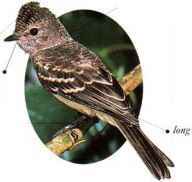 A slender tyrant flycatcher, this book-specics inhabits the lower levels tipped of rain forest and subtropical bill open forest. Its typical way of feeding is to watch from a perch anil llv out. either to seize an insect in the air or to take it from the foliage. The vivid, transverse crest is normally folded away and sometimes protrudes behind the head, resulting in a "hammerhead" look. 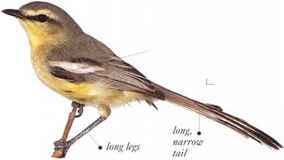 The male's crest is red, the female's yellow. • NliST A slender bag up to (>'/• ft (2 m) long, suspended from a branch, often over a stream. • DlSTRlBlJTION Mexico to Bolivia and s.E. Brazil. 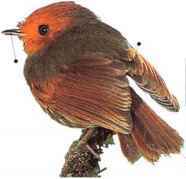 A small, inconspicuous flycatchcr, this bird perches in an upright posture, occasionally waving its fanned tail up and down ("flirting"), and swooping to seize insects in the air or on foliage. It frequents woodland on mountain slopes, as well as wooded canyons. • NliST A cup nest formed from plant materials, built in a hollow or cavity. • DISTRIBUTION Breeds ill VV. Canada and USA. Migrates as far south as VV. Mexico in winter. 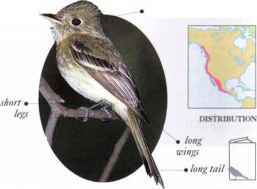 T his medium-size flycatcher of open forest or forest edge is often seen perching on an open branch or bare snag, from which it flics out to catch insects in midair. 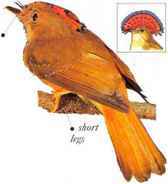 • NliST An open cup nest fixed on a horizontal branch, often high. • DISTRIBUTION Breeds in forests ofW. North America and mountain forests of Central America. Winters in South America as far south as Peru and Bolivia. 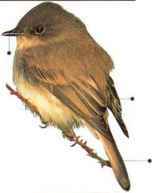 Named in imitation of its "fee-bee" call, the Eastern Phoebe lives broad. in open woodland and farmland, flat bill hunting insects from an open perch, usually near water. 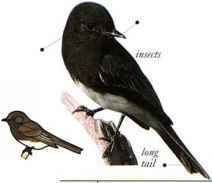 It has also adapted successfully to urban habitats, where it nests readily on buildings. While perched, it frequently bobs its tail up and down. • NliST A stout cup nest made of mud and plant materials, on a sheltered ledge. New nests are sometimes built on top of old ones. • DISTRIBUTION Breeds in C. and E. North America. Winters in S.E. USA and Mexico.